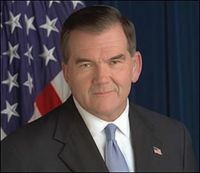 Tom Ridge (born August 26, 1945) is a former governor of Pennsylvania (1995 to 2001) and the United States Secretary of Homeland Security from 2001 to December, 2004. He attended Harvard University and graduated in 1967. In 1982, after serving in the Vietnam War with the Army and earning his law degree, he was elected to Congress as a Representative. He was reelected an amazing six terms in a row. In 1995 he was elected governor of the state of Pennsylvania where he served two terms in office. Shortly after the September 11, 2001 attacks on the Pentagon and World Trade Centers, Ridge was appointed by President George W. Bush as the first Office of Homeland Security Advisor in the history of the United States. He held the position until he stepped down on December 2, 2004. He was replaced with Michael Chertoff. Ridge was widely cited as a potential running mate for John McCain in his 2008 bid for the White House. His home state of Pennsylvania is a swing state that has voted for the Democratic candidate in the last 4 Presidential elections, and is often considered a "must win" for Obama. However, Ridge's stance on abortion is considered too liberal for many conservatives in the Republican Party. Beyond his views on abortion, Ridge is considered by many to be a liberal in other areas, such as opposing capital gains tax cuts, opposing the "Star Wars" missile defense program and failing to support school vouchers with enough zeal. This page was last modified on 9 April 2019, at 18:11.